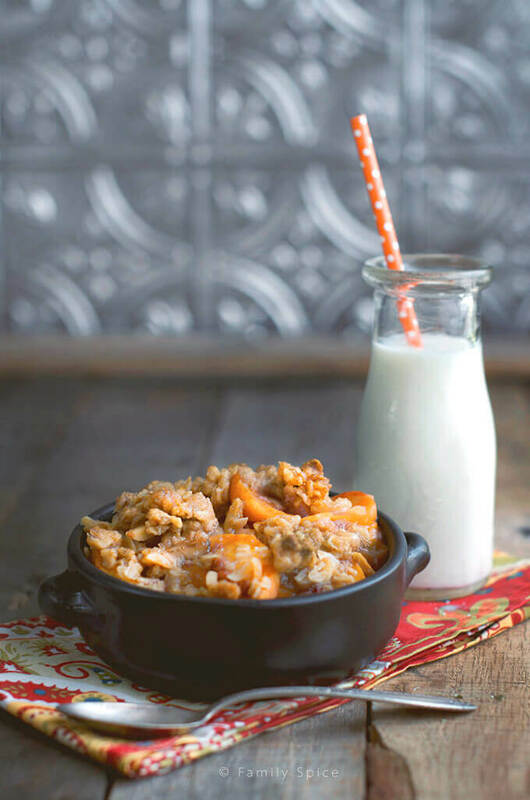 Whether you are out camping or have a hankering for peach crisp at home, this Campfire Dutch Oven Peach Crisp with Almonds is easy to whip up indoors or out with plenty of the crunchy crisp topping everyone loves. 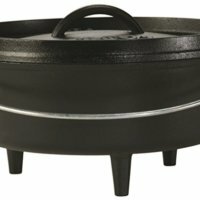 Find more of my cast iron Dutch oven recipes. I am a sucker for fruit desserts. As much as I love chocolate, I’ll take a slice of apple pie or berry cobbler over a chocolate cake. So when summer fruits are in season, my family and I easily go through a couple pounds of strawberries, blueberries, peaches and nectarines a week. And don’t forget the melons, too. 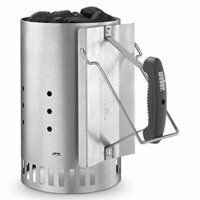 Summer time also means camping time or just general spending more time outdoors. We go to the beach, the park, the pool, you name it and enjoy more hiking, biking, swimming and general frolicking. And being outdoors more, means cooking outdoors. 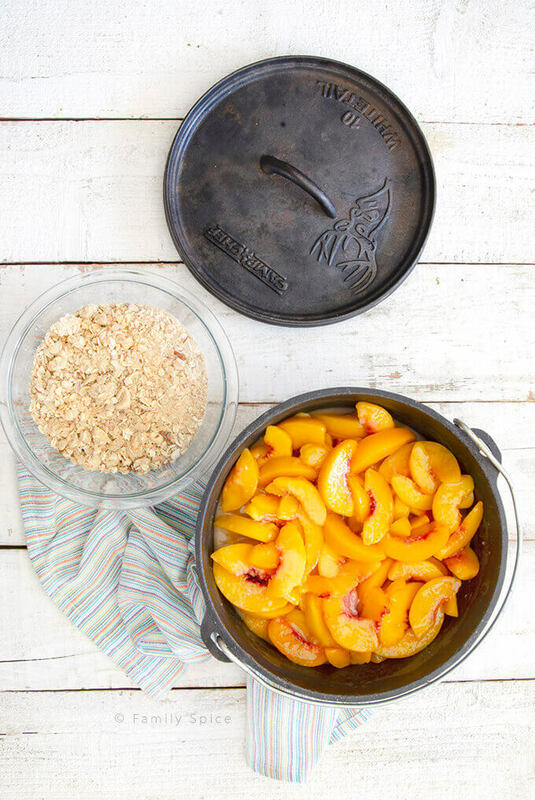 And that’s where I really shine, easy recipes to cook outdoors, like this campfire Dutch oven peach crisp with almonds. What is the difference between a crisp and a cobbler? Only in America do we have so many fruit desserts that come in so many varieties and are called by such strange names. I will do my best to help you muddle through this wonderful world of fruit desserts! Betty: Made with layers of fruit and buttered bread pieces (or crumbs) and baked together. Buckle: A cake like batter baked in a pan with fruit placed on top. As the cake bakes, the fruit sinks down and bakes in the center. Cobbler: Baked in a casserole dish with fruit on the bottom and sweet biscuit dough pieces on top. Crisp: Baked in a casserole dish with fruit on the bottom and a crispy topping over it. Similar to a crumble, except that the topping contains oats and nuts. Crumble: Fruit baked on the bottom with a crumbly streusel topping made from sugar, flour and butter. 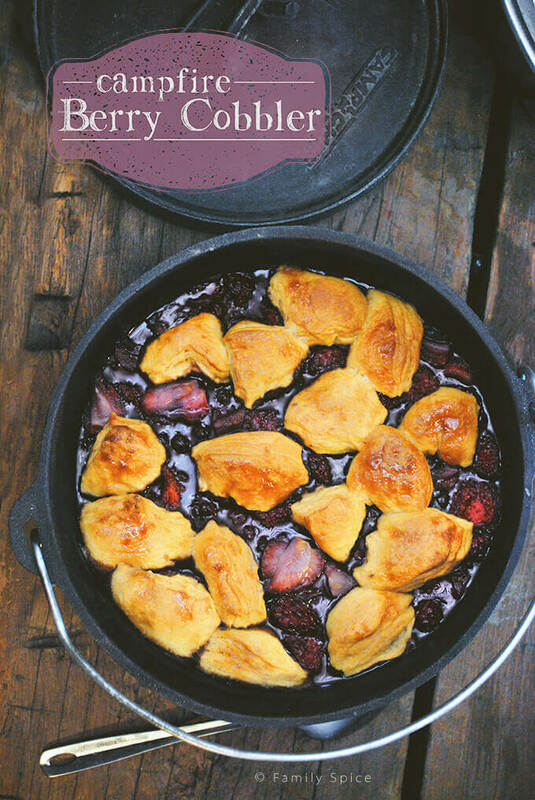 Grunt: Similar to a cobbler, but made in a skillet on the stove top. Also called a slump. Pandowdy: Fruit baked on the bottom with rolled pastry on top. Once out of the oven, the pastry is then broken into pieces to absorb the sweet fruit juices. Pie: Pastry crust on the bottom with fruit in the middle and sometimes more pastry on top. Can I use frozen fruit to make a crisp? And one of my favorite fruits to use is the peach! You can use practically any fresh fruit that is in season, like berries, apples and even grapes. But I especially love using peaches. 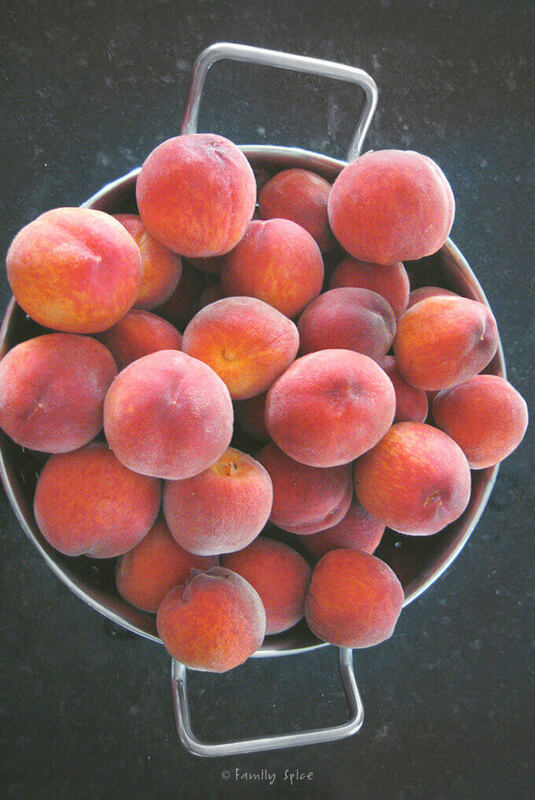 In August, peaches are in abundance and I they are truly the perfect fruit: juicy, sweet and oh so full of flavor. 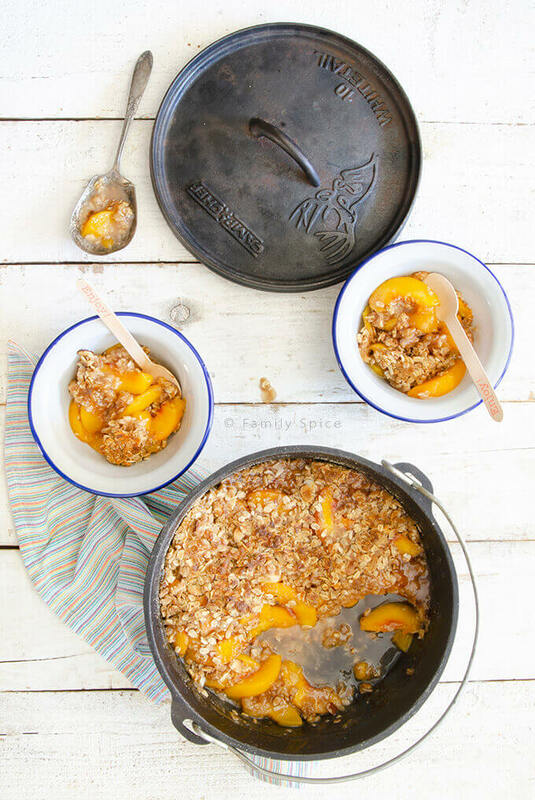 And they are true perfection in this Dutch oven peach crisp. But alas, peeling all those peaches can seem like a lot of work. Let me share with you a little secret. Frozen peaches work beautifully in this Dutch oven crisp, as well. And when you are camping, you can easily place a frozen bag of peach slices in the cooler. It works both as an ice pack in the cooler, and as it thaws, they are easy and ready to throw together in a crisp. 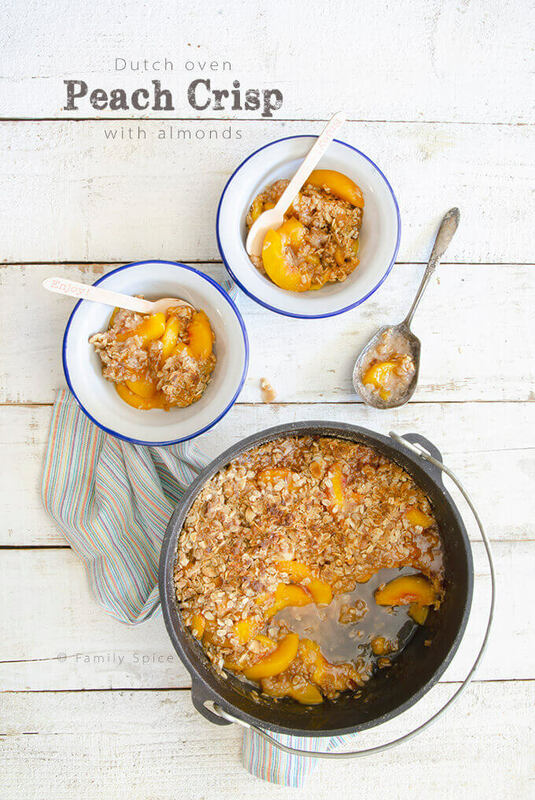 But do NOT use canned peaches, please, for this Dutch oven peach crisp. Canned peaches are poached in a sugary syrup and filled with preservatives. They will turn to mush when baked in a fruit crisp and will be way too sweet, in my honest and humble opinion. 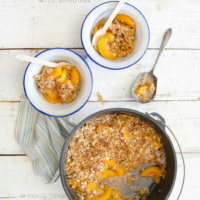 So stick with fresh or frozen peaches when making this Dutch oven peach crisp. 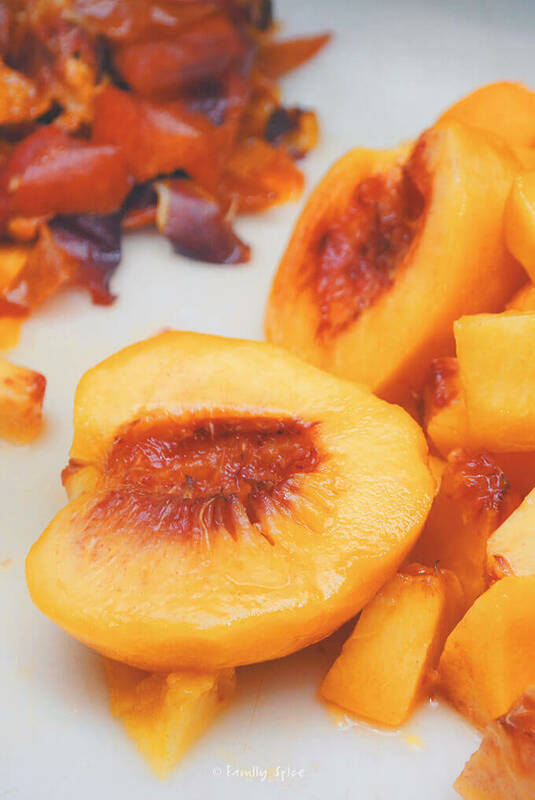 Do you have to peel peaches for peach crisp? This question can be answered based on personal preference. I personally, like to have the peaches peeled when I use them in baked goods. Many times the peel separates from the fruit and you are fishing out peach peels from your peach crisp. Some people swear by NOT peeling their peaches when making peach crisp or any other baked peach dessert. I leave it up to you and your own personal preferences. If you do use fresh peaches, and you are peeling the peaches, I recommend using a serrated peeler because it grabs the edges of the peach skin beautifully. Ripe peaches are also easier to peel so look for firm yet ripe peaches to use in this peach crisp. Once you get a corner pulled up, it easily separates from the rest of the fruit. Some people blanch their peaches in hot water, like you do for tomatoes, to help remove the peel. Choose whichever method works better for you. 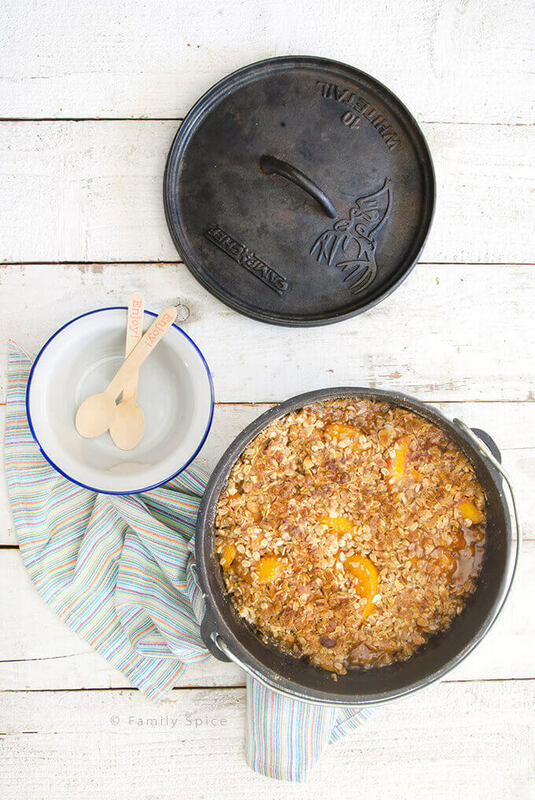 This recipe for Dutch oven peach crisp works for a 10-inch Dutch oven. That’s about 3-pounds of peaches and will feed up to 8 people. 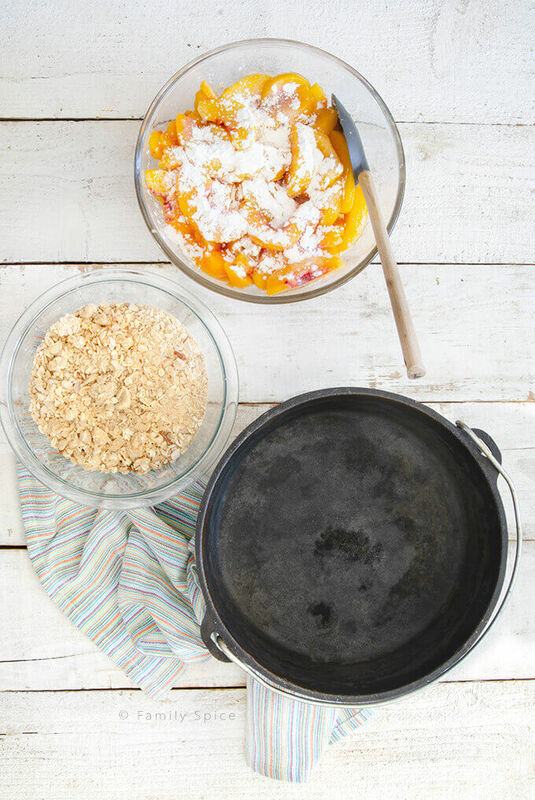 Pour the peach mixture into your Dutch oven and sprinkle your crisp topping over the fruit. 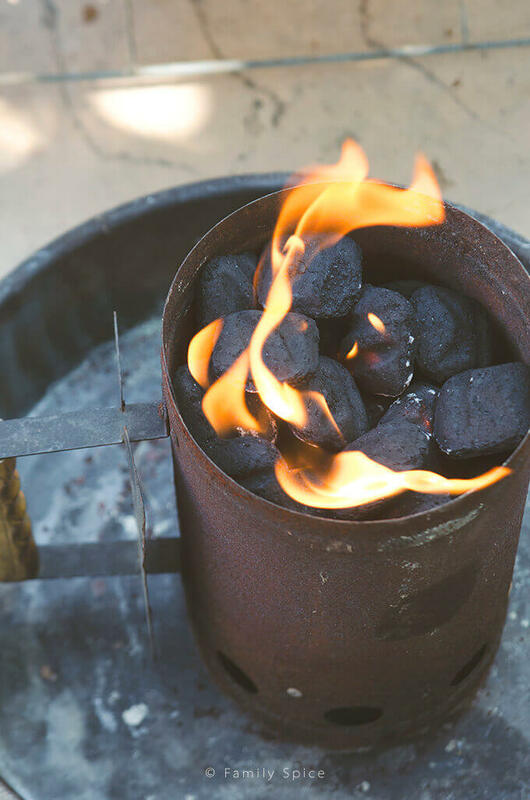 If you are baking this peach crisp outdoors and using a 10-inch Dutch oven, place 14 coals on top and 8 coals underneath and bake for 45 minutes. 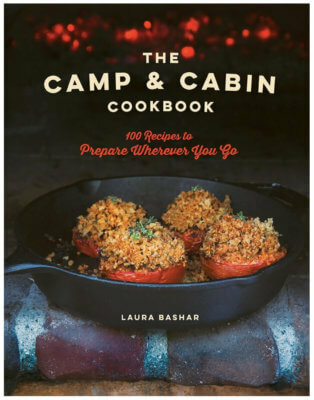 Just as you have favorite home recipes that you want to make on a camping trip, some of our favorite camping trip recipes can be made at home. 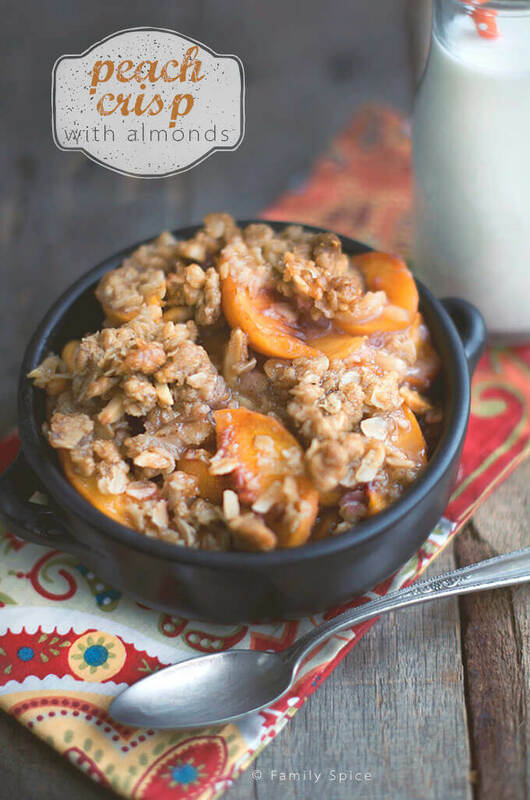 This peach crisp can easily be baked in your kitchen oven as it can be baked over a campfire. You can bake your peach crisp at home in a cast iron skillet or any oven safe baking dish. Again, simply pour in the peach mixture, sprinkle over the topping and bake at 350ºF for about 45 minutes. How do you reheat peach crisp? One reason I love a peach crisp so much, besides all of that peachy goodness, is that it can be enjoyed hot, warm or cold. Cakes require cooling before you add frosting and you would never dream of reheating it before you eat it. But a crisp is really delicious warm, especially topped with some vanilla ice cream. So if you are making this crisp at home for a party and want to make it ahead of time, you totally can make it the day before and reheat it again. To reheat your peach crisp, or any fruit crisp, take it out of the refrigerator and let it stand at room temperature for about 1 hour before serving. Then reheat in the oven at 350°F for about 20 minutes. Presto, warm fruit is ready to enjoy! Whether you are out camping or have a hankering for peach crisp at home, this Campfire Dutch Oven Peach Crisp with Almonds is easy to whip up with plenty of the crunchy crisp topping everyone loves. 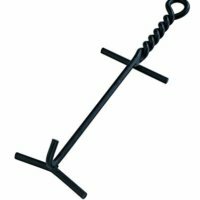 In a chimney, light up 22 briquettes. Peel and remove seed from peaches. Cut in slices and place in a large mixing bowl. Mix in lemon juice, granulated sugar, lemon zest and cornstarch with the peaches and set aside. In a small bowl, combine remaining ingredients, using your fingers to pinch and rub the dry ingredients in with the butter untill coarse crumbs form. Transfer peach mixture and all of the juices into a 10-inch Dutch oven and spread out evenly. Sprinkle oatmeal topping over the peaches and cover completely. Cover the pot and set 8 coals underneath the Dutch oven and 14 coals on the lid. Bake for 45 minutes or until topping is golden brown and fruit is bubbling. Remove top from the Dutch oven and let crisp cool for 10 minutes before serving. To prepare at home, bake peach crisp in a shallow 2-3 quart baking dish and bake at 350ºF for 45 minutes or until topping is golden brown. Serve alone, with whipped cream or vanilla ice cream. You can also use walnuts or pecans instead of almonds. I’m going stone fruit tasting today – just saying!!!! We love crisps in our house. Lucky you! That sounds like my kind of fun! Just beautiful. Dessert or breakfast! Oooooh yes! Crisp for breakfast is perfect! !